Mature trophont of Amoebophrya tintinni (x 2000). Sagittal view, right and left half. Note the presence of a single nucleus. Cachon 1964. Vermiform of Amoebophrya tintinni (x 1000). Cachon 1964. 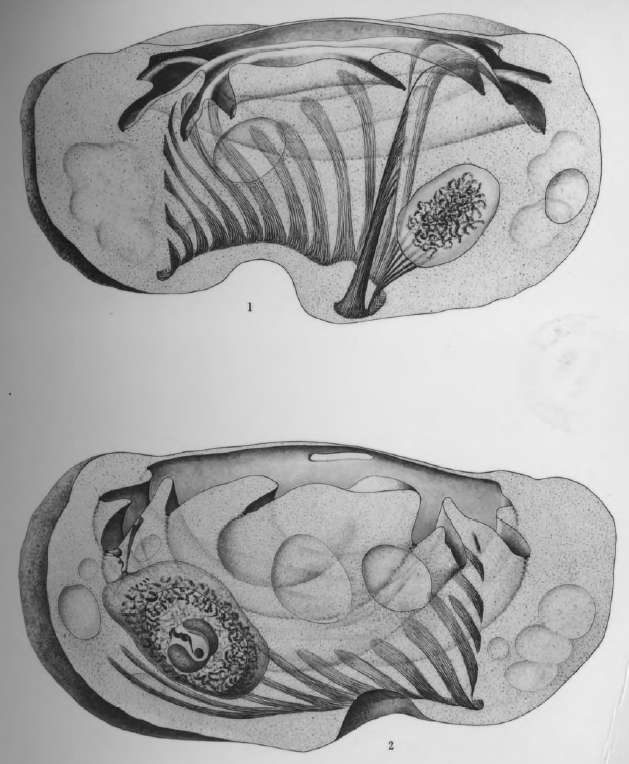 From Plate 35 of Cachon 1964: Figs 2-4 Amoebophyra tintinni: trophonte, veriforme et sporocytes in the lorica of Xystonella lohmanni. Diagnosis_Genus: Amoebophrya Koeppen 1984. Intracellular parasites. 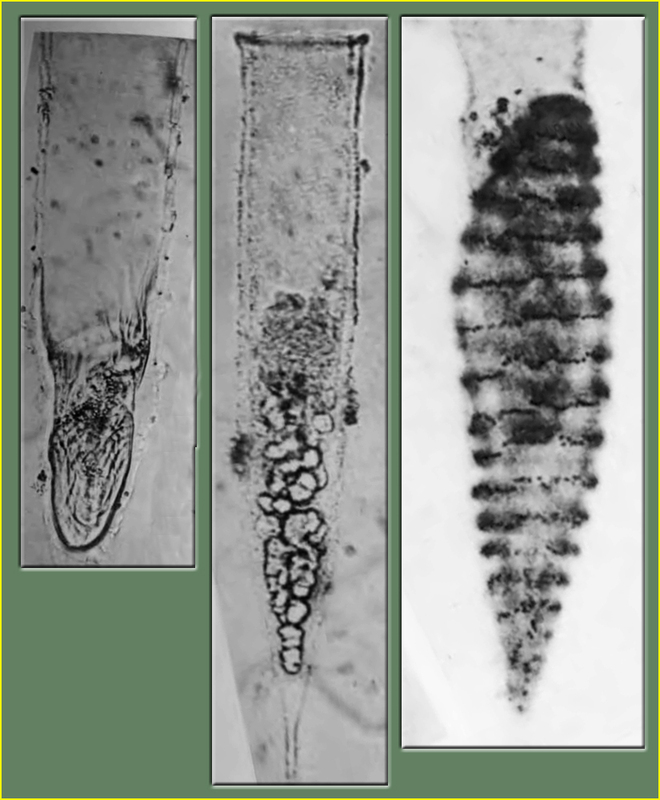 Smallest trophonts observed have 3 µm long, a gymnodiniales form, with a large hypocone and a small rudimentary epicone. The hypocone broadens at its base and forms a cup-shaped circumvallation, turning in spiral. The hypocone starts to cover the epicone (in other word, the epicone becomes progressively invaginated into the hypocone, forming a cavity, the mastigocoel, which is a characteristic of the genus Amoebophrya. This mastigocoel remains open by a small aperture at the apex of the trophont. Sporogenesis starts rapidly during this transformation. The inner surface of the mastigocoel is furnished with helically coiled ridges as a result of a continuous lengthening of the previous dinospore girdle during the trophic growth. Along these ridges countless flagella are inserted. Flagella of future dinospores (the free-living stage of the parasite) are produced inside the mastigocoel. At the end of the intracellular maturation, flagella started to beat, and what was the epicone at the origin, directed through the aperture of the mastigocoel, moved forward. This evagination make the flagella outside the structure, which is now called the vermiform. This action breacks out the host membrane, releasing the vermiform outside. This vermiform is closed forward (at the epicone side), but open in the back. When release, this part forms a large digestive vacuole that contains what remains from the host. This vermiform considerably strechs out with time. The spore chain forming the vermiform rapidly separates to produce spores (gymnodinial shape), generally of two different sizes (macrospores and microspores). These spores have a large epicone and a reduced hypocone (the reverse of what is observed during the first stage of the trophont). Diagnosis_species: Amoebophrya tintinni Cachon 1964. Parasite infecting the tintinnid Xystonella lohmanni (Brandt). Resembling to Amoebophrya ceratii, with few differences. The trophont could be either plurinucleate or, more rarely, having a single voluminous nucleus. The cytopharynx (see the description of Amoebophrya ceratii) is well developped and cylindrical.